July 11th, 2018 marks the 10 year anniversary since mobile deep linking technology was first made available to developers with the release of iOS 2.0. Since then, it’s become something of a divisive topic. Detractors from the worlds of academia and industry have cited security concerns and an alleged lack of practical applications as deterrents to investment. On the other end, most successful shopping and music app marketers now depend on deep links in conjunction with dynamic ad creative to minimize funnel friction and drive conversions. Traffic numbers show that deep link usage among shopping, music, and lifestyle app marketers can be up to 60 times higher than that of other app categories like travel, gaming, and food & drink. Marketers in the second group are missing out on some valuable opportunities. As average overall engagement and retention numbers continue to decline, it’s time for mobile growth marketers of all categories to take a hard look at deep links and reevaluate the role they play in modern growth stacks. Evidence has shown that UA campaigns leveraging deep links can produce user segments with growth metrics twice as high as those acquired without them. In many cases, the key to their success has been deferred deep linking, which can direct users into contextually relevant onboarding flows even if they don’t initially have the app installed. By passing data to the app to be used after install, deferred deep links can augment UA funnels and create first time user experiences that lay the foundation for better retained user bases. Here are just a few ways mobile growth marketers of all categories can start using deferred deep links to drive growth and foster engagement. Combined with targeted ad campaigns on social media, deferred deep links can be used in conjunction with in-app promotions to create intuitive onboarding flows that deliver on promises made in campaign creative. 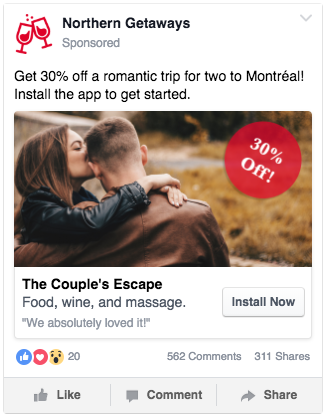 A travel app offering discounted vacation packages to couples could run a Facebook campaign like this one. Using deferred deep links, which Facebook supports natively, the app could then direct the users directly to that in-app promotion during their first session. Tenjin marketers can track resulting deep link revenue, along with all other campaign and ROI data, by adding their Tenjin deep link URL to campaigns via Facebook ad manager. This is one of the more common applications of deep link usage, but it only scratches the surface of what’s possible. The power of cultural influence has become core to many app marketing strategies. The gaming industry in particular, where popular streaming personalities cultivate unprecedented levels of engagement with their audiences, has come to rely on influencers to drive downloads and fuel engagement. With deferred deep links, influencer marketing campaigns can be made exponentially more effective through ties to in-game social mechanics. A strategy/RPG game publisher looking to drive installs through partnerships with Twitch streamers could create and supply unique deferred deep links that, when used to install the app, automatically add users to the respective streamer’s in-game guild or clan. By dovetailing game mechanics with community engagement, mobile game publishers can minimize onboarding friction, drive activation, and boost retention. It’s also an effective way for marketers to ensure they’ll see returns on what can often be a higher-risk channel, given that influencer campaigns don’t offer the same helpful feedback loops as programmatic channels. Maintaining a regular content publishing schedule has become table-stakes for brands of any kind, and mobile apps are no exception. While plenty of web-based commerce and lifestyle brands have been using internal link structures to turn content traffic into conversions for years, a new wave of B2C brands are either built for mobile from the ground up (Uber) or are now seeing immense amounts of revenue shift over to mobile channels. Starbucks, which now sees more than 30% of revenue come through its mobile app, is an example of the latter. The Seattle-based coffee giant also maintains an active corporate blogging presence, running regular feature stories on seasonal products. Using deferred deep links, Starbucks could easily start using these and other owned content pieces to kickoff curated onboarding experiences for their mobile product, ultimately arriving at a conversion opportunity for the product that drove readers to take action in the first place. This sort of integrated funnel activity provides content marketers with another performance metric they can use to steer their efforts while making meaningful and measurable contributions to the brand’s bottom line. With the mobile app landscape growing more competitive every day, marketers need to use every tool available to them to drive growth and foster engagement. Deferred deep links, while perhaps not the newest solution, represent an opportunity for growth teams of any size to improve funnel flow and positively impact key performance metrics in their user base. To learn more about how Tenjin can help your team take advantage of deferred deep links as part of your app’s growth strategy, feel free to get in touch with us at sales@tenjin.io.